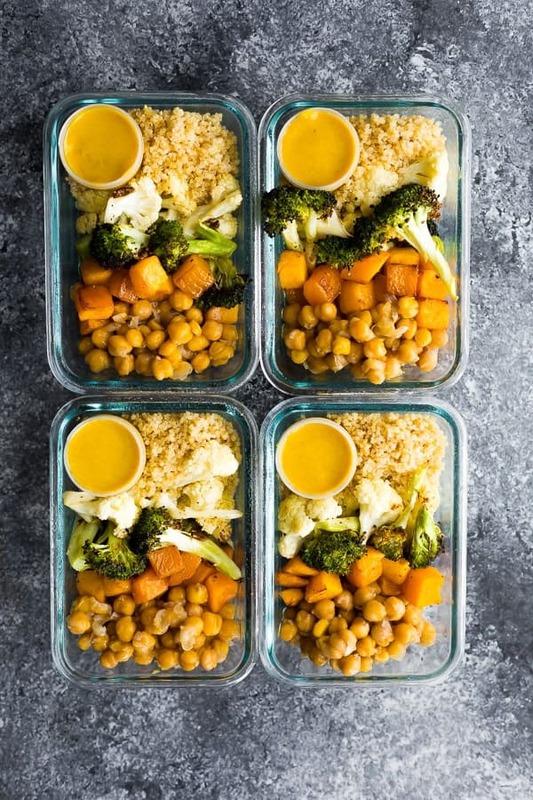 This vegan roasted vegetable meal prep has a tangy turmeric tahini sauce for you to drizzle over everything! If there’s one thing I know about fall, it’s that sheet pan meals are king. I like to do ‘clean out the fridge’ meal preps, where I find anything in the bottom of my crisper and throw it on the sheet pan. Sometimes I use one of these 7 Spice Blends on the veggies, but for today’s recipe, I whipped up a delicious turmeric tahini sauce! Like I mentioned, you can swap out these vegetables for a number of different vegetables including sweet potato, brussels sprouts, carrots and bell peppers. Cook up some quinoa…I use my rice cooker to cook quinoa! Divide the cooked quinoa and a can of cooked chickpeas between four meal prep bowls, then portion out the veggies. 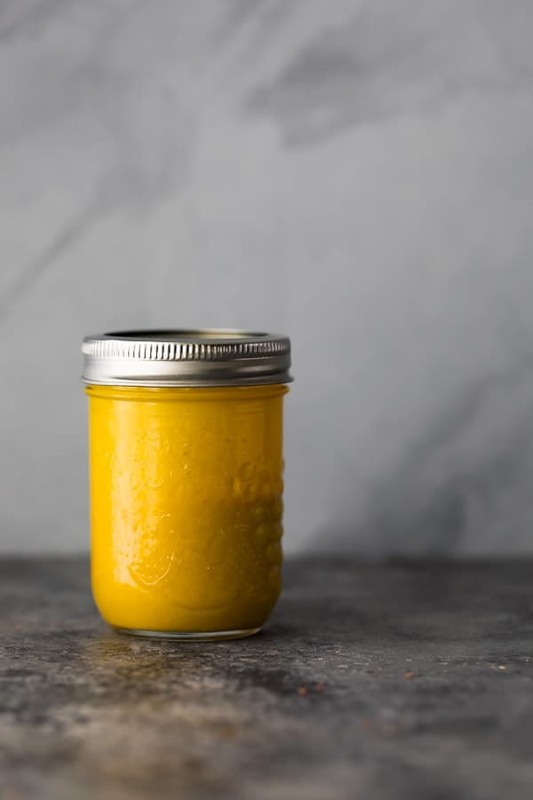 Shake up the turmeric tahini sauce. Portion out into small condiment containers…don’t drizzle the sauce on until just before you serve! 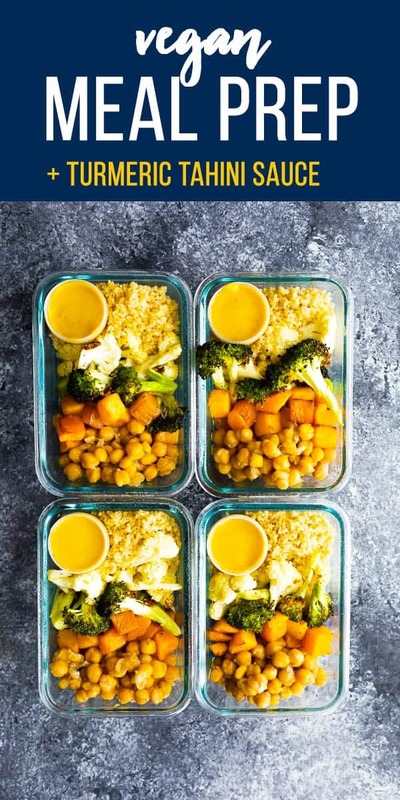 How long are these roasted vegetable meal prep bowls good for? You can store these in the fridge for up to 4 days. I don’t recommend freezing roasted vegetables as they can end up slimy. Can I swap the turmeric tahini sauce? Sure! You could use this Maple Tahini Dressing, or the Almond Butter sauce from these Cold Sesame Noodle Bowls. You could also use this Balsamic Reduction for a totally different flavor! 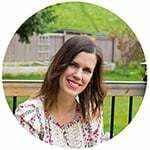 Looking for more vegan meal prep recipes? 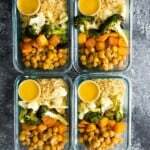 Try these Pineapple BBQ Tofu Meal Prep Bowls, these Portobello Fajita Meal Prep, this Vegan Teriyaki Meal Prep or this round up with more than 65 Vegan Meal Prep Recipes! 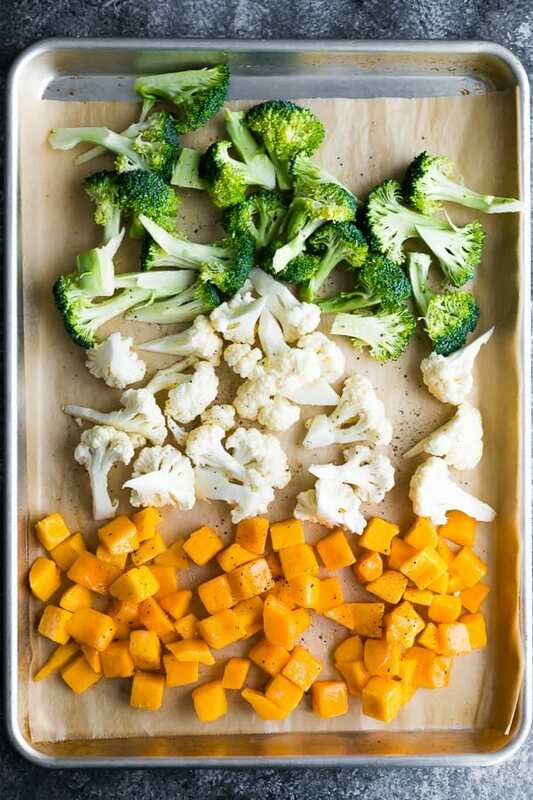 Toss the butternut squash, broccoli and cauliflower in olive oil. Arrange on a large baking sheet and sprinkle with salt & pepper. Roast vegetables for 20-30 minutes, until soft and cooked through. Butternut squash *may* take slightly longer than the broccoli & cauliflower. 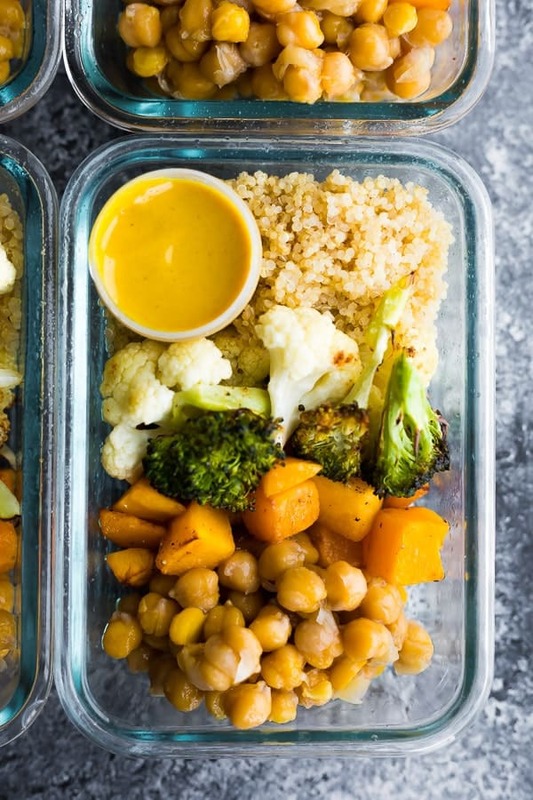 Remove turmeric tahini sauce and heat meal prep bowls until steaming hot. Dress with the tahini sauce and enjoy.